Whether it’s short-term or long-term, parking your car at Pittsburgh International Airport can add up. We know when you get back from your business trip or vacation, the last thing you want to do is find out you have a high parking bill to pay. That’s why at PIT Stop Airport Parking, we offer discounted parking rates that can help you save money every time you travel. When you park at PIT, you’ll have to maneuver through dozens of other travelers in order to find an open parking spot, which can be a hassle. With our Pittsburgh Airport parking company, however, you can enjoy premium valet service that can make your experience quick and easy. Once you arrive at our location, simply check in, hand us your keys, and be on your way to catch your flight. We’ll do the work of finding a parking spot for your car and we’ll park it safely for you while you’re away. Best of all, you’ll pay less when you choose PIT Stop! At PIT Stop, every discounted parking reservation comes with free shuttle service to get you to and from PIT. After you check in, we’ll load your luggage onto our comfortable shuttle and drive you to the airport. Your ride will be just a few minutes long and once we get there, we’ll drop you off right at your terminal and unload your luggage for you. 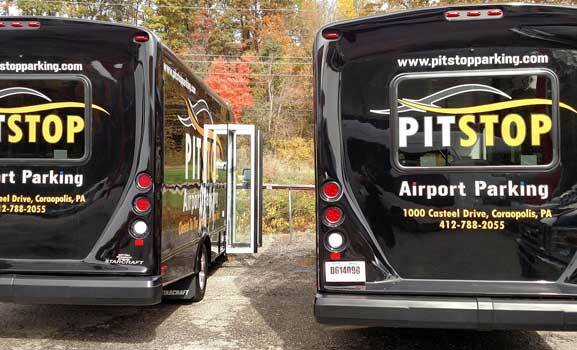 Our Pittsburgh Airport parking shuttles run frequently, so you’ll never have to wait long for a ride. The next time you fly out of PIT, skip the Pittsburgh Airport parking and make a reservation with PIT Stop for the best discounted parking rates. We even offer special parking rates for corporate travelers!